Put Business Process Management and Complex Event Processing together and you get intelligent business processes that react to changing business conditions in real time, providing continuous visibility-in short, an instantly responsive enterprise. Over the last several years, business process management (BPM) has evolved from a mysterious alchemy of arc-and-bubble graphics to a mainstream tool of the trade that integrates IT technologies for business advantage. In parallel, complex event processing (CEP) has expanded beyond being applicable only in the isolated domain of foreign exchange trading and is now improving a broad range of processes-from transportation logistics to customer relationship management. Put BPM and CEP together and you get intelligent business processes that react to changing business conditions in real time, providing continuous visibility-in short, an instantly responsive enterprise. bombarded with a million events per second, CEP is the only technology that can filter out unnecessary data; recognize patterns; and aggregate, process, and derive composite events that have an impact on business processes. 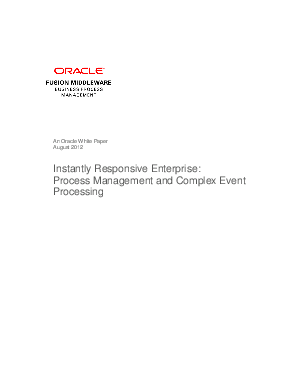 Download this white paper to learn more about instantly responsive enterprise: process management and complex event processing.